This field trip will take you to the best shorebird viewing areas along the coast! 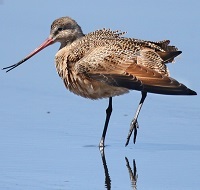 Target birds are 22 species of shorebirds including Snowy Plover, Willet, and Long-billed Curlew. Good numbers of waterfowl and other water species will be encountered along the way. "Streaked" Horned Larks and Lapland Longspurs will also be sought after at Midway Beach Road. There will be some walking but most of the day will involve short visits to key areas in search of shorebirds. Bring or pre-order a lunch and dress appropriately! This beautiful coastal resort town hosts some of the best birding spots on the West Coast with more species per location than anywhere else in the state of Washington. The tour will visit a variety of habitats and upwards of 60 species may be found. Highlights on this trip include: Semipalmated Plover, Whimbrel, Marbled Godwit, Sanderling, Wandering Tattler, Surfbird, and Rock Sandpiper. Easy Walking! Huynisisoos is a great vantage point from which to observe seabirds over the open ocean. Pelagic Cormorants, Common Murres, and Tufted Puffins nest in the scenic seastacks. This may be the southern most nesting area for the "Sooty" Fox Sparrow. Huynisissoos is on Quinault Tribal lands and a Tribal guide will accompany the trip. Impressive totem pole on grounds. Uneven, easy to moderate path; wear appropriate footwear. A bus will take you to the Sandpiper Trail at Grays Harbor National Wildlife Refuge where you will walk 1/2 mile on a boardwalk to the prime shorebird viewing area at the tip of Bowerman Peninsula. 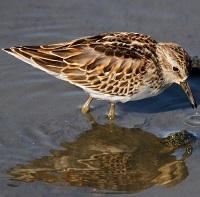 As the shorebirds gather on the mudflats, you can learn to distinguish a Western Sandpiper from a Dunlin. 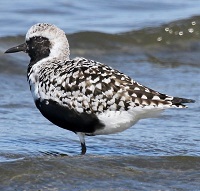 Other possible birds include: Least Sandpiper, Black-bellied Plover, Red Knot and Peregrine Falcon. We see other wildlife too, like weasels! Join in on a guided walk to the prime shorebird viewing area along the Sandpiper Trail at the Refuge. Knowledgeable guides will provide information about the Refuge and other wildlife and plants of interest along the trail. These walks are free and open to the public. The guides will have spotting scopes for better viewing. Binoculars are recommended. Leaves from the Kiosk at the Airport gate. 2 miles round trip flat walking.